Not gold, not used, not wanted in cash registers...one has to wonder why they were minted at all. Made by the government in 2000, it is even stranger since in 1999 the SBA dollar was minted again and is generally listed as a failure also. It does become an interesting set to put together though. 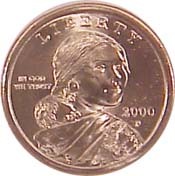 In 2009, this is now known as the Native American Dollar, with changing reverse design and moved date. or may not be in stock. There are now 57 coins in this set, and counting. Here is complete set for only $260 cash price.